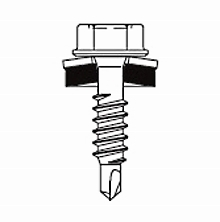 The stainless steel metal roof, lap seam and metal to metal fastener is designed to self-drill and join metal panels in roofing and siding applications. Drill capacity: .031 – .060 Some applications may require attaching light gage (24-26 ga) to sub-structural member. Composite thickness should not exceed .060". • SX Austenitic stainless (300 series) fasteners Bi-metal welded carbon steel point. • SX Austenitic stainless product line offers fastening solutions for attaching panels from very thin to over 1/2" structural steel. • Provides ultimate corrosion performance for attaching steel, stainless or aluminum panels. • Washer O.D designed for both sidewall and roof panel attachment.